In fitness today, core training has become strongly associated with improved appearance and a well defined mid-section. However, there is debate about which exercises or type of training is best to achieve this desired result. Some individuals point to stability exercises (planks, side planks, etc) which involve little to no movement as the only way to improve the abdominal muscles without increasing risk of injury. Others still promote traditional movement based exercises such as crunches, torso twists, etc. This course presents an evidence based, tested core training program to build a strong and aesthetically pleasing mid-section combined with the ability to function efficiently in the real world. By understanding the place and purpose for different types of core training exercises and methods, you can progressively increase the challenge of your training programs for clients of all levels and take the entire core (versus merely the abs) to a new level of function. This course is part two in a two part series. 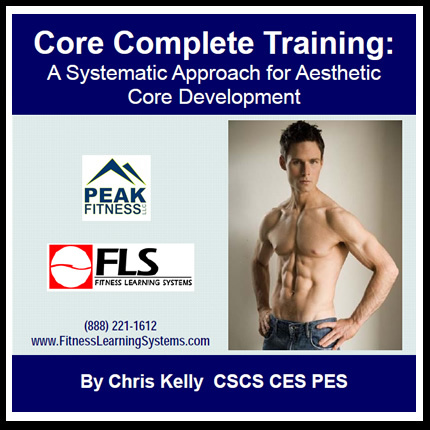 Part one is Restore the Core: Integrated Core Training for Real World Function. Learn core assessments for determining a client’s initial core fitness level, any compensations or problems, and to determine progress.